If you agree with that wisdom too, then you’re in the right place. In this guide, we aim to cover the science behind fertiliser, what it’s made of and when you should ideally be using it. Now, the truth is you should apply a fertiliser feeding schedule almost all year round - but we’ve made a handy table for you to know when is best to fertilise a lawn. It is commonly thought that the main purpose of fertiliser is to make grass green – while it is true that this happens, a typical compound fertiliser will do more than just that. 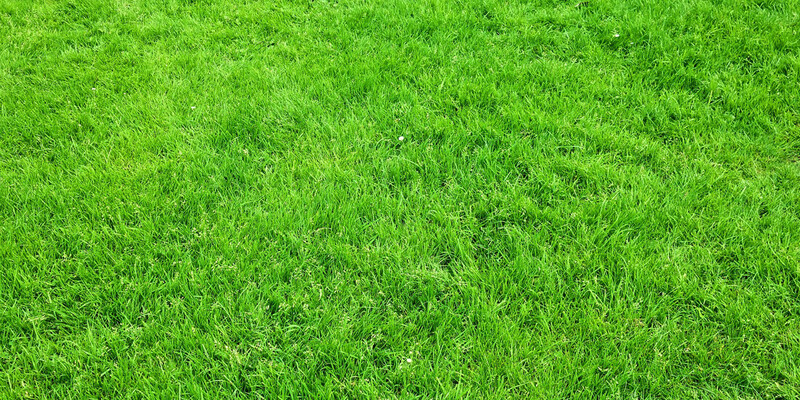 By using a compound fertiliser instead of just the lawn nutrient on its own, you’ll see that the grass really is greener on the other side as not only will the grass be green, but it will also be well established and protected against disease come autumn / winter. So, what is a compound fertiliser? Find out in our ‘Science-y Bit’ below. Next up we’ve got the science-y bit of fertiliser – what your lawn needs and what is in fertiliser. The three nutrients that any lawn needs are: Nitrogen, Phosphate and Potassium – also known as the acronym NPK (each letter represents the nutrients element initial). These nutrients all serve varying purposes, and when combined to make a compound fertiliser – are very useful indeed. Nitrogen (N) is responsible for giving the lawn its lush green colour by stimulating leaf growth and helping to establish the lawn. Phosphate (P) is known for building up the root system and improving seed to soil contact. Potassium (K) can help to harden grass so that it builds up an immunity / tolerance to disease and drought. An example of the NPK level of our QUICK RELEASE: Spring / Summer is 9.7.7. This shows that the concentrate of Nitrogen is slightly higher than the Phosphate and Potassium, encouraging fast growth of greener grass with the added extras of a strengthened root system and protection against drought. As there isn’t much difference between the levels of each nutrient – you could consider this fertiliser as a bit of an ‘all-rounder’ to kick start the spring season. An example of a very different NPK level to this would it’s opposite – our SLOW RELEASE: Spring Summer which has an NPK of 12.6.6. You can tell that the concentrate of Nitrogen is double that of the Phosphate and Potassium concentrate, meaning that it will help your grass grow greener and stimulate leaf growth, but will be slower in terms of building up your lawns root system and tolerance against drought, disease and discoloration. It is recommended that this fertiliser is applied March to August, so as not to let the lawn reach its peak, before peak season! There are some other fertiliser factors to consider besides NPK levels. Weather, season, types of fertiliser (granular / liquid) and how to apply them will influence your final fertiliser choice. You will also need to consider what the main utilities / characteristics are of the lawn you are planning to fertilise and what you are expecting from the lawn. Whatever season, or for whatever reason you may be fertilising your lawn – you should do it a few days after the weather forecast is to be ‘showery’, but don’t do it when it is showering! On the ideal day to fertilise your grass, your grass will be dry, but the soil will be moist, allowing it to absorb the fertiliser you are applying. If you can, avoid applying fertiliser when there has been prolonged dry weather – if you really must, hose down the lawn and apply the fertiliser the next day or so when the grass has dried. Once you’ve applied your chosen fertiliser you should hope for some of that showery weather to roll back again so the soil can absorb the feed further. If the rain has gone to Spain and doesn’t make an appearance – hose down the lawn again to give it a little help along the way. Remember you can manually water your lawn if needed, and if you can do it on an overcast day. You’ll find that most fertiliser products will specify the season they are for. At The Grass People, we specify our fertilisers by Autumn / Winter, Spring / Summer. These are different fertiliser mixes with different NPK concentrate levels created specifically for each season. As we previously covered, varying levels of Nitrogen, Phosphate and Potassium can have different effects on your grass. Although a high concentrate of Nitrogen is useful in a Spring / Summer fertiliser, it won’t be in an Autumn / Winter fertiliser when you’re hoping to give the mower a much-needed break! There are two types of fertiliser – liquid and granular. For our domestic fertilisers, we promote a granular product. A granular fertiliser is a full proof fertiliser and may cause less scorching as the fertiliser goes directly into the soil, whereas a liquid fertiliser may end up coating the blades of grass if not used correctly. In short, a liquid fertiliser takes a lot more preparation and expertise to use – in addition, the liquid fertilisers we sell could fertilise a football pitch! There are four main ways to apply fertiliser to a lawn, and this is where the type of fertiliser really does matter – no one should apply a liquid fertiliser with their bare hands! Hand Application – used for granular fertiliser to scatter across the lawn. Hand-Held Distributor – there are two typically on the market – one that requires you to wind the handle to distribute granular fertiliser, and another that has a nozzle to allow you to spread the liquid fertiliser. Liquid Dilutor – this is for liquid fertiliser that is spread through a hose. Wheeled Distributor – this one requires quite a bit of skill and is for granular fertiliser – completed correctly, you should be able to thoroughly cover the lawn. There are pros and cons to each method, but ultimately you should choose which application method is easiest for you, suits the fertiliser product you intend to use and will provide full coverage without risk of scorching and/or double-dosing the lawn. Fertilisers can be quick or slow acting depending on their NPK levels which will also dictate what time of year they should be used in. A quick way to understand what to expect from fertilising a lawn is to check the NPK level on the fertiliser you have chosen – this will give you the best indication of the speed at which your lawn should go green / establish and be protected against disease.